Trolley Treats–DADDY I WANT SOME CANDY!!! First off, thank you so much everyone for indulging me in a short blogging break. I have been busy–I did graduate with my MFA after all–so it’s not like I’ve been sitting around with nothing to do. Well, there has been SOME sitting around. And plenty to do. But I was recharging. So we’re still over here at the Mouse-Next-Door and playing around on the new Buena Vista Street. As many of you know (or don’t), Buena Vista Street is the new entrance to Disney California Adventure Park. It’s like Main Street but set in the 20s when Walt first arrived in Los Angeles. And it’s awesome. 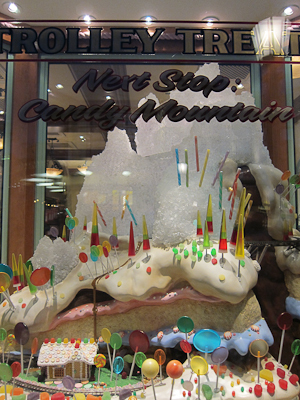 One thing I love is the candy store, Trolley Treats. 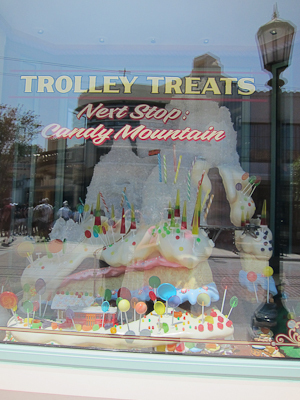 You can recognize Trolley Treats by the giant candy mountain in its window. Sign me UP! 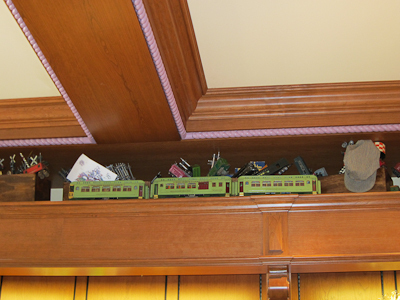 Also there’s a model train that runs around there. Now look, I’m a candy addict. It’s a flaw. But I love it. Chocolate, fruity, gummy, sour candy, I rarely discriminate. The only thing I don’t like is mint chocolate. Other than that? Bring it. 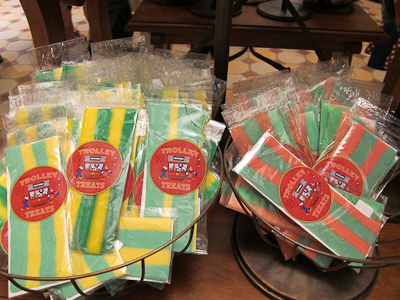 So a candy store right there on Buena Vista Street makes my little sugar-powered heart jump with joy. 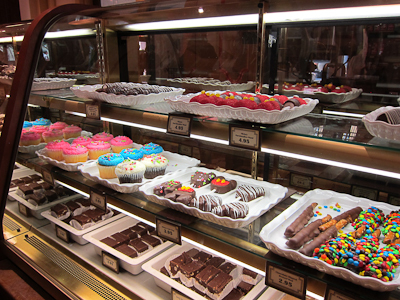 Trolley Treats has that beautiful sight–the Disneyland candy counter. 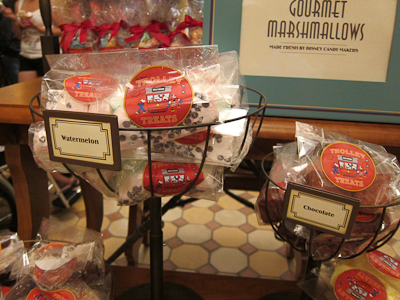 Anyway, one of the best things about Disneyland candy stores is that each location has a few special items made only in that store. 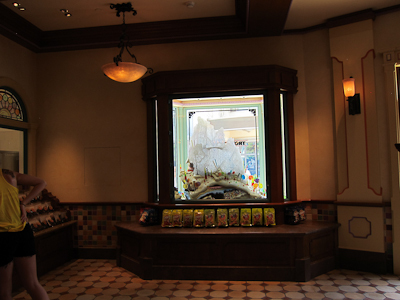 For example, the Tigger Tails and Hunny Pot Crispie Treats at the Pooh Corner Store. Trolley Treats is no exception. 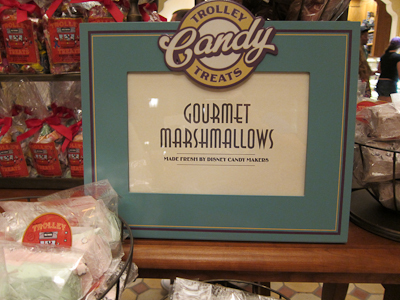 Yep, Trolley Treats serves up some gourmet marshmallows. I’ve been meaning to make my own marshmallows for a long time. Seriously! They don’t look that hard, and I keep thinking I’ll make some chocolate marshmallows to put in hot chocolate, but then I realize it’s practically August so I’ll have to do it later, and then I’m like oh, handmade Christmas gift! Awesome marshmallows! And then I forget or run out of time and just buy people Target gift cards or something. Not just any kind of taffy, either. It’s that super-thin flavored taffy. The kind where if it’s at all a bit hot or maybe you just hold it in your hands too long, it’s very hard to get off the paper, but if you stick it in the freezer (at home) and whack it on the counter top it breaks into convenient bite-sized pieces. When I was a kid I loved taffy so much I named one of my hamsters Taffy. Of course, I also had a hamster named Twerp because I liked the word. 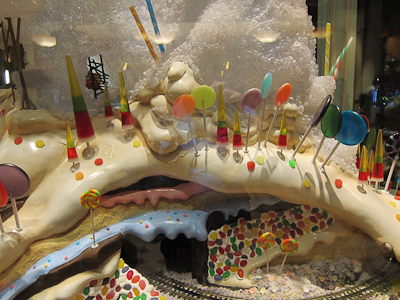 The rest of shop is–well, I was concentrating on the candy, but if you look up, there’s some trolleys!